The Ashley’s Bend is a very secure bend which is easy to untie, yet it’s hard to shake loose. It’s named after the famed knot expert Clifford Warren Ashley who is believed to be the first to have documented the bend in his book, the Ashley Book of Knots. Whether this claim is earned is always hard to tell with knots, but nonetheless, Ashley’s Bend is a very secure way of joining two lines. Especially when working with thin rope. 1. Start off by making a crossing turn in line A, crossing working end end underneath the standing end. Take line B and tuck it through the center of line A’s crossing turn, back to front. Create a crossing turn in line B by crossing the working end underneath it’s standing end. 2. 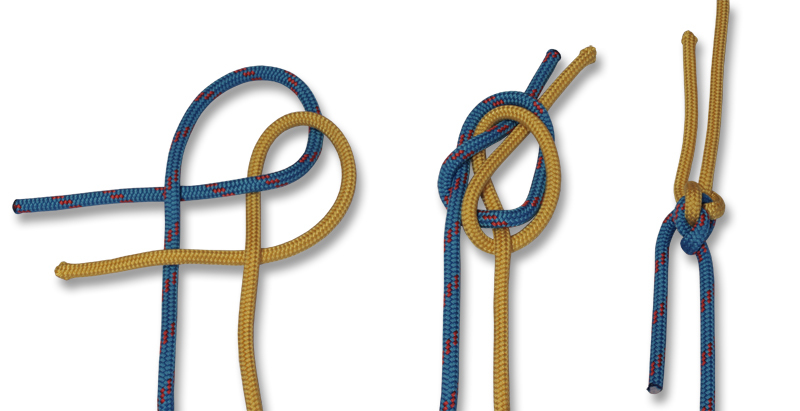 Take the working ends of both lines to the front of the knot while holding both crossing turns together. Tuck the two working ends through the center of the two crossing turns, front to back. 3. Dress the knot by first pulling on the working ends while pushing the knot down. Then separate the two standing ends by pulling them away from each other.